The name Gabriel means "man of God," or "God has shown himself mighty." It appears first in the prophesies of Daniel in the Old Testament. The angel announced to Daniel the prophecy of the seventy weeks. His name also occurs in the apocryphal book of Henoch. 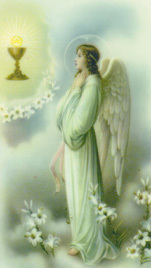 He was the angel who appeared to Zachariah to announce the birth of St. John the Baptizer. Finally, he announced to Mary that she would bear a Son Who would be conceived of the Holy Spirit, Son of the Most High, and Savior of the world. The feast day is September 29th. St. Gabriel is the patron of communications workers.